In this post, we will introduce the git ubuntu clone subcommand and take a brief tour of what an imported repository looks like. git ubuntu clone will be the entry point for most users to interact with Ubuntu source packages, as it answers a common request on IRC: “Where is the source for package X?”. As Robie alluded to in his introductory post, one of the consequences of the git ubuntu importer is that there is now a standard way to obtain the source of any given source package: git ubuntu clone1. sudo snap install --classic git-ubuntu. Help is available via git-ubuntu --help and man-pages are currently in development 2. With that one command, we now have the entire publishing history for php7.0 in ./php7.0. Anyone who has tried to find the source for an Ubuntu package before will recognize this as a significant simplification and improvement. With git, we would expect to be on a ‘master’ branch after cloning. 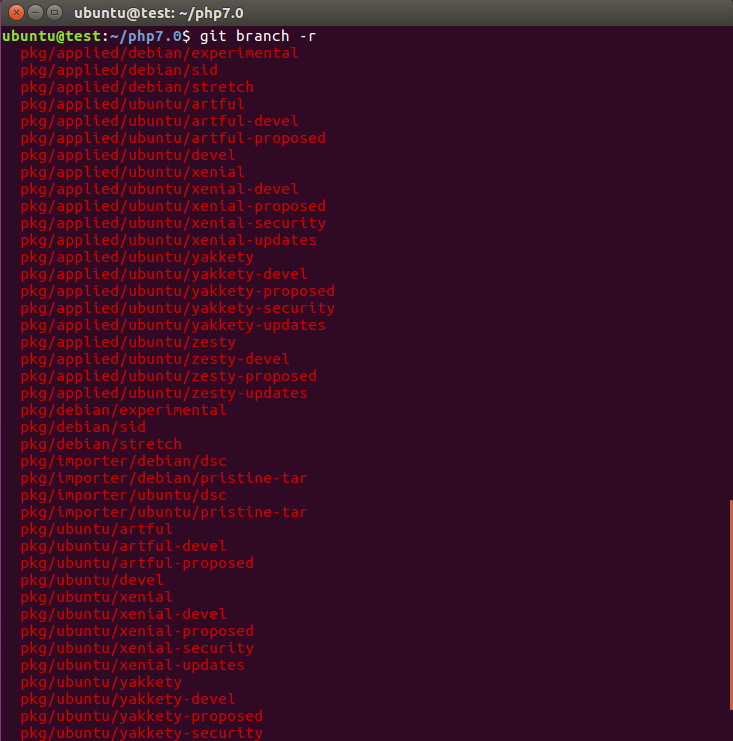 git ubuntu clone defaults to a local branch ‘ubuntu/devel’, which represents the current tip of development in Ubuntu. ‘ubuntu/devel’ is branched from the remote-tracking branch ‘pkg/ubuntu/devel’. Running git remote, we see two remotes are already defined: ‘pkg’ and ‘nacc’. ‘pkg’ will be the same for all users and is similar to ‘origin’ that git users will be familiar with. The second is a derived remote name based upon a Launchpad ID. As shown above, the first time run git ubuntu runs, it will prompt for a Launchpad ID that will be cached for future use in ~/.gitconfig. Much like ‘origin’, the ‘pkg’ branches will keep moving forward via the importer and running git fetch pkg will keep your local remote-tracking branches up to date. While not strictly enforced by git or git ubuntu, we should treat the ‘pkg/’ namespace as reserved and read-only to avoid any issues. The tip of ‘pkg/ubuntu/devel’ reflects the latest version of this package in Ubuntu. This will typically correspond to the development release and often will be the version in the ‘-proposed’ pocket for that release. As mentioned earlier, a local branch ‘ubuntu/devel’ is created by default, which starts at ‘pkg/ubuntu/devel’, much like ‘master’ typically starts at ‘origin/master’ by default when using git. Just like the tip of ‘ubuntu/devel’ is the latest version in Ubuntu for a given source package, there are series-‘devel’ branches for the latest in a given series, e.g., the tip of ‘pkg/ubuntu/xenial-devel’ is the latest version uploaded to 16.04. There are also branches tracking each ‘pocket’ of every series, e.g. ‘pkg/ubuntu/xenial-security’ is the latest version uploaded to the security pocket of 16.04. Finally, there is a distinct set of branches which correspond to the exact same histories, but with quilt patches applied. Going into the reasoning behind this is beyond the scope of this post, but will be covered in a future post. It is sufficient for now to be aware that is what ‘pkg/applied/*’ are for. All of these branches have history, like one would expect, reflecting the exact publishing history of php7.0 within the context of that branch’s semantics, e.g., the history of ‘pkg/ubuntu/xenial-security’ shows all uploads to the security pocket of 16.04 and what those uploads, in turn, are based off of, etc. As another example, git log ubuntu/devel shows you the long history of the latest upload to Ubuntu. With this complete imported history, we can not only see the history of the current version and any given series, but also what is different between versions and releases 16.04 and 17.04 for php7.0! For other source packages that have existed much longer, you would be able to compare LTS to LTS, and do all the other normal git-ish things you might like, such as git blame to see what introduced a specific change to a file. As Robie mentioned in the first post, we are currently using a whitelist to constrain the importer to a small subset of source packages. What happens if you request to clone a source package that has not yet been imported? While many details (particularly why the repository looks the way it does) have been glossed in this post, we now have a starting point for cloning any source package (if it has been imported) and a way to request an import of any source package. Technically, git ubuntu clone is equivalent in functionality to git clone and git clone could be used directly. In fact, one of our goals is to not impede a “pure” git usage in any way. But again, as Robie mentioned in his introductory post, there are some caveats to both using git and the structure of our repositories that git ubuntu is aware of. 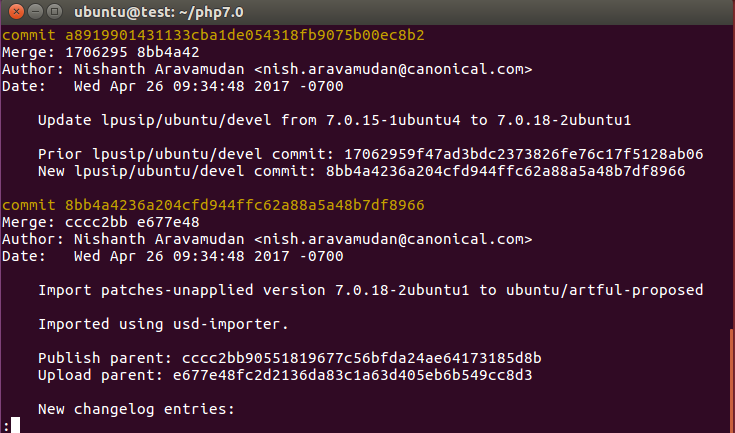 The “well-defined URLs” just mentioned are still being worked on, but for instance for PHP 7.0, one could follow the instructions at the top of the Launchpad code page for the php7.0 source package. The primary differences we would notice in this usage is “origin” instead of “pkg” and there will not be a remote for your personal Launchpad space for this source package. In this post, we have seen a new way to get the source for any given package, git ubuntu clone. Robie’s next post will discuss where the imported repositories are and what they look like. My next post will continue discussing the git ubuntu tooling, by looking at another relatively simple subcommand “tag”. I recently worked on a fix for LP: #144499 in Ubuntu’s cloud images where every instance (VM or LXD container) using a given cloud image would end up sharing the iSCSI initiator name. The iSCSI initiator name is intended to be unique, so that you can not only uniquely identify which system is using a given target on the iSCSI server, but also, if desired, restrict which initiators can use which targets. This behavioral change was introduced by the fix for LP: #1057635; which was working around a different issue with initiator names by re-instituting an older behavior in Ubuntu. In effect, the open-iscsi package can either configure the iSCSI initiator name at install time or at boot time. This generation is controlled by a helper script seeing GenerateName=Yes in /etc/iscsi/initiatorname.iscsi; if it does see that string, then it generates a new unique initiator name using another helper. Ideally, this would be done at first-boot time (by the helper script), however if iSCSI is used for the root device, the initramfs will not contain a valid initiator name and will fail to find the root iSCSI disk. So, 1057635 re-instituted the prior Ubuntu behavior that the initiator name is created when the open-iscsi package is installed. In order for iSCSI root to work, though, open-iscsi needs to be pre-installed in the installer environment (“seeded” in Ubuntu parlance), or if using images, needs to be installed by default so the image can use iSCSI. That results in processes like the CPC cloud image creation installing the open-iscsi package during the image creation. But that installation ends up creating an initiator name due to the prior bug. And thus every instance using that image has the same initiator name! To fix this, at least somewhat, I added a hook to the CPC image generation which, if it detects that /etc/iscsi/initiatorname.iscsi exists, overwrites it with GenerateName=yes. Thus, on the start of any instance using that cloud image, a new unique initiator name will be used. As posted on the ubuntu-server mailing list we had our first Ubuntu Server Bug Squashing Day (USBSD) on Wednesday, March 22, 2017. While we may not have had a large community showing, the event was still a success and their is momentum to make this a regular event going forward (more on that below…). This post is about the goals behind USBSD. The Server Team has a triage rotation for all bugs filed against packages in main, which is purely an attempt to provide adequate responses to ‘important’ — ensuring we have ‘good’ bug reports that are actionable and then to put them on to the Server Team’s queue (via subscribing ~ubuntu-server). The goal for triage is not to solve the bugs, it’s simply to respond and put it on the ‘to-fix’ list (which is visible here. But we don’t want that list to just grow without bound (what good is it to respond to a bug but never fix it? ), so we need to dedicate some time to working to get a bug to closure (or at least to the upload/sponsorship stage). Encourage community-driven ownership of bug-fixes and packages. While Robie Basak (rbasak), Christian Ehrhardt (cpaelzer), Josh Powers (powersj) and myself (nacc) all work for Canonical on the Server Team on the release side of things (meaning merges, bug-fixes, etc), there simply is not enough time in each cycle for the four of us alone to address every bug filed. And it’s not to say that the only developers working on packages an Ubuntu Server user cares are us four. But from a coordination perspective for every package in main that is ‘important’ to Ubuntu Server, we are often at least involved. I do not want to diminish by any means any contribution to Ubuntu Server, but it does feel like the broader community contributions have slowed down with recent releases. That might be a good thing ™ in that packages don’t have as many bugs, or it might just be that bugs are getting filed and no one is working on them. By improving our tooling and processes around bugs, we can lower barriers to entry for new contributors and ideally grow ownership and knowledge of packages relevant to Ubuntu Server. That is a rather long-winded introduction to the goals. Did we meet them? To the first point, it was a positive experience for those of us working on bugs on the day to have a dedicated place to coordinate and discuss solutions (on IRC at FreeNode/#ubuntu-server as well as well on the Etherpad we used [requires authentication and membership in the ~ubuntu-etherpad Launchpad team]. And I believe a handful of bugs were driven to completion. To the second point, I was not pinged much at all (if at all) during the US business day on USBSD #1. That was a bit disappointing. But I saw that cpaelzer helped a few different users with several classes of bugs and that was awesome to wake up to! He also did a great job of documenting his bugwork/interactions on the Etherpad. Follow-on posts will talk about ways we can improve and hopefully document some patterns for bugwork that we discover via USBSDs. In the meanwhile, we’re tentatively scheduling USBSD #2 for April 5, 2017! For the first, I posted several questions to LKML/linux-iio/linux-input because it seemed like `watch -n 0.1 cat /sys/bus/iio/devices/iio\:device*/*raw*` was not updating on my system. It definitely did at some point, but most recently it was not. Well, I went and grabbed iiotools and after building it with some changes (no longer defined constants), it seems like `lsiio` caused the IIO sensors to unstick. But the /dev/ nodes were still not producing output. Discussing this further upstream, it seemed like a new quirk was needed. After updating my system to Gnome 3.18 with the PPAs for gnome3 and gnome3-staging, and installing iio-sensor-proxy, auto-rotation worked! For the second, I again worked a bit upstream. It sounds like Linus had hit something pretty similar and a hack/workaround was proposed. A more complete fix (but not yet final) is here, but I expect there to be another version based upon Benjamin Tissoires‘ reply, which will finally close the race with suspend/resume. This makes me rather hopeful that 16.04 out of the box (well, except maybe the DisplayLink drivers) will be have all the hardware on the Yoga 900 enabled! With my previous foray into getting most of the base hardware with my Yoga 900 working, I wanted to look at hooking up some of my accessory purchases, a Dell 3100 USB 3.0 docking station (including 3 video outputs, which is the maximum for the SkyLake generation of integrated video as I understand it) and a 4K external monitor (I also have an older 28″ external monitor I’d like to keep using, but it’s still hooked up to my to-be-reinstalled-upon-leaving-my-current-job desktop). First complication was the display output of the Yoga 900, which is over the brand-new USB-C port. The cables that came with both my docking station and monitor, for high-speed video over USB, were standard USB cables. Radioshack sells (for $29.99, which seems bit steep, but I was in a rush) a USB-C to USB adapter. Without the adapter, you can plug the D3100 into one of the other super-speed USB ports, but you won’t see the DisplayLink interfaces in lsusb’s output (the dock also has 3 super-speed USB ports, 2 normal USB ports, an Ethernet port, and a 8mm headphone jack). So, get the adapter (or something similar) and now all of the ports show up in dmesg and lsusb. Except that Linux can’t talk to the DisplayLink devices. Turns out, though, DisplayLink is working on a driver (not yet investigated if they are going to upstream this themselves or not…) for Ubuntu. The script they ship claims to only work with up to 3.19, but 4.4-rc4 seems fine (just not officially supported). Also, the underlying installer script only knows about 14.04.x and 15.04, and I’m on 15.10. It only needs to detect this version string, though, for determining whether to use upstart or systemd configurations. A trivial change the embedded installer script to use systemd on 15.10 and everything seems to work. Note that by default, the Ubuntu kernel .config signs kernel modules. And this module is not signed using DKMS (as I understand it), so you’ll need to make sure your .config doesn’t have kernel module signing enabled. But once you have that all installed, and plug in the USB-C adapter, the display(s) immediately are recognized and placed next to the built-in display’s screen. Could be a lot harder! As I begin to transition away from my current job, I figured I’d take advantage of my little IBM discount on Lenovo products and order myself a snappy new laptop. I chose a Lenovo Yoga 900 and was very impressed immediately by the size and quality of the product. And, of course, I immediately wanted to get rid of Windows. I had a Ubuntu GNOME 15.10 image already on my USB key, so I simply needed to figure out how to get to the BIOS or Boot Menu. Turns out there, is a small button on the right side of the Yoga 900, called the Novo button, which when used to power on the system allows you to access the BIOS menus. Worked like a charm! Out of the box, Ubuntu 15.10 installed fine, although the /boot partition selected by the auto-partitioner is so small as to be useless if you want to actually build multiple kernels on the system (and you are going to need to for 15.10!). So I resized it up to 1GB and moved on. So, maybe not “most” in some sense, but hey. Luckily, the wireless fixes were already upstream, so it was just a matter of putting an appropriate .deb from http://kernel.ubuntu.com/~kernel-ppa/mainline/ on the USB key and installing it. Rebooting and I had wireless. Note, the reason for this is because the Yoga 900 does not have a hardware rfkill switch like some Lenovo products do. So without a quirk for the Yoga 900, the kernel was interpreting the rfkill switch as always being on, and failing to enable the wireless. to pull in any fixes since I made my USB key. Since I wasn’t going to be currently using the Ubuntu-provided linux-image-generic kernels, I went ahead and removed those packages first, to minimize the download size. To get the touchscreen and touchpad working, I needed to apply the 16-patch series posted at https://lkml.org/lkml/2015/11/30/441. I git-cloned Linus’ tree and applied the series, building a 4.4-rc4-based tree. That series is planned for v4.5, btw, so the patching should only be necessary for one more cycle. Booting into that kernel, the touchscreen and touchpad worked! I proceeded to remove the kernel from the PPA, since it wasn’t fully functional, and now I’ve got a pretty nice setup. I also purchased a new external monitor and USB docking station from Dell. Based upon my reading of the specs, I think they should work, once I get a USB-C (the only video output on the Yoga 900) to standard USB adapter (the docking station and monitor both came with the rest of the cables). That’ll be my next post!